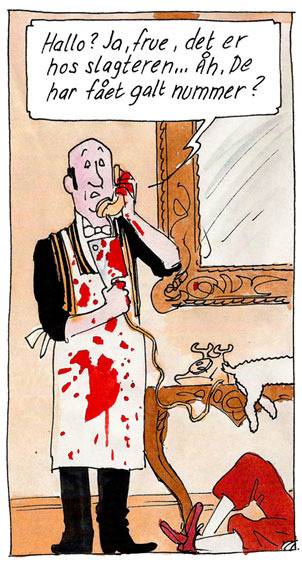 Wrapping up our week-and-a-half-long celebration of Hergé’s centenary is Danish cartoonist’s cartoonist Jan Solheim. He is known for a large number of at times hilarious, at times touching, and always dazzlingly drawn anthology contributions, two of the best of the more recent ones in BLÆK, for which he also did the amazing cover. His grand epic “Lava,” serialized in the anthology Fahrenheit in the 90s, remains unfinished but is nevertheless considered classic. American readers might remember him from the story “Drive-By”, written by Steven T. Seagle in ONI Double Feature a good number of years back. Check out his website here, an old archive of his work here, and his Lambiek entry here. Thanks for staying with us! Hope you enjoyed the drawings and all the rest. Long live the work of Hergé! Also, check out the artwork in the previous instalments, by Mårdøn Smet, Miwer, Johan Krarup, Peter Kielland-Brandt, Ole Comoll Christensen, T. Thorhauge, Simon Bukhave and Peter Becher. And be sure to read our freewheeling discussion of Hergé’s work. First of all, ArtWatch director Michael Daley has written a fine obituary of James Beck who passed away on Saturday. Secondly, back in February, Neil Cohn posted content about the 5.000-year old Persian comic that has just gone on display at the National Museum in Tehran, including an animation of the strip and a link to a number of pictures of it and the goblet it’s painted on. As you may have noticed, our daily celebration of Hergé’s centenary is on hold (we deeply apologize for any inconvenience!). Instead we’d like to offer a great link, leading you to a clever conversation in which The Smartest Cartoonist on Earth™ – why, Chris Ware of course – discusses Tintin, Hergé and ligne claire. The interview was done by America’s PBS ( Public Broadcasting Service) a while ago, when Danish documentarist Anders Østergaard’s Tintin et moi (2003) went on the air. Well, what are you waiting for? Click, read, now! (Also, click along at the bottom of the page and read interivews on the same theme with Dan Clowes, Phoebe Gloeckner, Jason Lutes and Seth!). Farting Tubers, Battling Produce and Badass Cephalopods! This tongue-in-cheek blog post links to some amazing 19th-Century Japanese cartooning – woodcuts showing allegorical battles between octopi, insects, fish and fruit, multi-user fart duels and the like. There’s some amazing character design involved here, and some truly funny mise-en-scène. Thanks to Dirk for the heads-up. 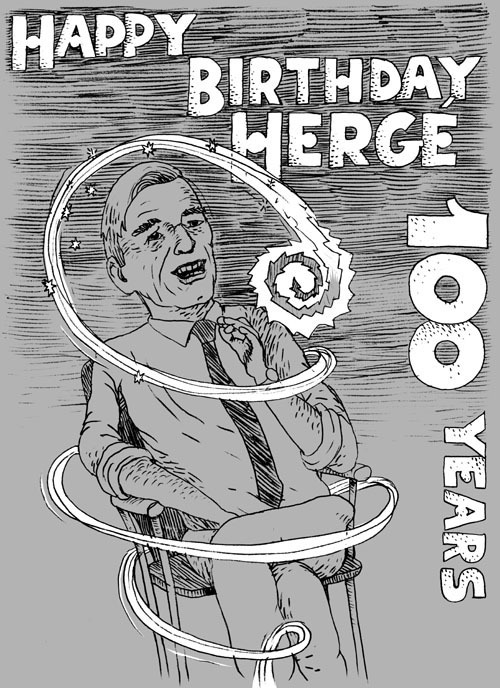 Yes, our celebration of Hergé’s centenary continues – we’ve now hit the one-week mark and are still going strong! Today’s drawing is by one of Danish fandom’s movers and shakers, the inimitable Peter Becher! Deeply involved in Danish fandom as a consultant and translation coach for the editors of the Complete Carl Barks, currently being published in Scandinavia, as well as co-editor of the legendary Nørd Nyt (‘Nerd News’), as well as the online nerd haven SerieJournalen (for which he has done a special Tintin pop quiz – in Danish, sorree! – for the centenary), his credentials are not to be fornicated with. Also, check out the artwork in the previous instalments, by Mårdøn Smet, Miwer, Johan Krarup, Peter Kielland-Brandt, Ole Comoll Christensen, T. Thorhauge and Simon Bukhave. And be sure to read our freewheeling discussion of Hergé’s work . A goat rising on its hind legs to eat from a tree, depicted moment-to-moment around the circumference of a 5.000-year old drinking goblet from Persia, discovered at the site of the Burnt City in the Sistan va Baluchestan province in southeastern Iran. The picture is small, but there’s no denying the efficient and charming cartooning at work here. It’s part of an exhibition that just opened at Iran’s National Museum in Tehran, entitled “10.000 years Persian Culture and Civilization”. More here. Thanks to Mike Rhode for the pointer. 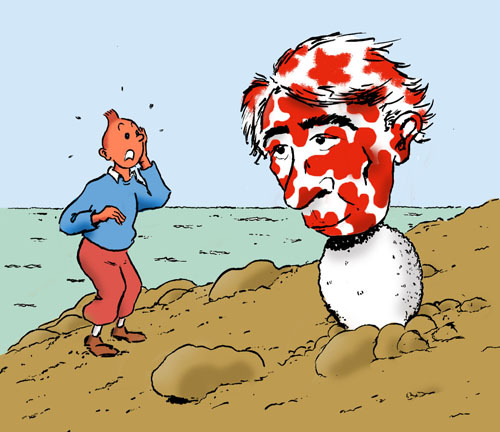 Our celebration of Hergé’s centenary continues! Today’s drawing is by Simon Bukhave, one of the most promising young Danish cartoonists. 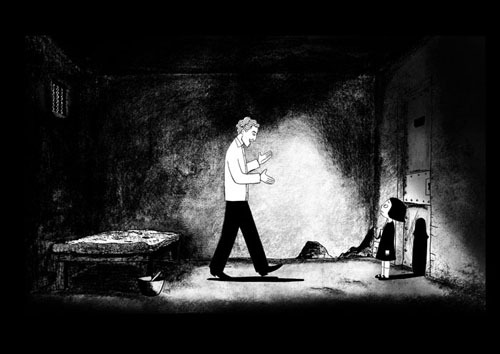 So far, Simon has created two beautiful comic books, Ghost (2002) and Alt hvad jeg har i min ene hånd (2006), both wordless and meticulously drawn in black and white. Simon also contributed to BLÆK, the French edition as well as the Danish (check them out in our ‘works‘ section). Visit Simon’s site and read his entry in Lambiek. Simon is part of Studio Over Floden in Copenhagen, working with Mårdøn Smet, Miwer, Johan Krarup and myself. Also, check out the artwork in the previous instalments, by Mårdøn Smet, Miwer, Johan Krarup, Peter Kielland-Brandt, Ole Comoll Christensen and the one by, well, myself. 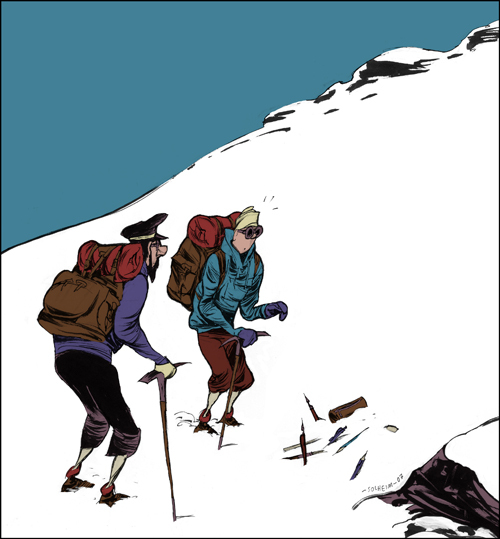 And be sure to read our freewheeling discussion of Hergé’s work . 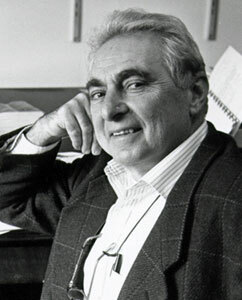 Dr. James Beck, Professor of Art History at Columbia University and one of our preeminent scholars of the Italian Renaissance, died on Saturday at the age of 77. This is a great loss, both of an extraordinary scholar and a controversial curmudgeon to the field. Yup, that’s right. Persepolis shares the prize with Carlos Reygada’s Stellet Licht. Congratulations to Marjane Satrapi and Vincent Paronnaud. Palme d’Or goes to Cristian Mungiu’s 4 mois, 3 semaines et 2 jours. For more Persepolis-related stuff, keep watching the MySpace site devoted to the film and the Sony Films site. Our celebration of Hergé’s centenary continues! Today’s drawing is by the Bunker’s own T. Thorhauge. His debut, Det der går forud is still available from Fahrenheit, and the French edition, Table rase, published by Éditions Rackham, can be acquired here. Other significant comics work can be found in Rackham #2, 4 & 5 as well as Forandringstegn and the two BLÆK books – see our ‘works’ section for more info. He doesn’t have a website besides this one, but a lot of his writing can be found at Rackham. Also, there’s a really old interview with him here, and another here (both in Danish, unfortunately). Also, check out the artwork in the previous instalments, by Mårdøn Smet, Miwer, Johan Krarup, Peter Kielland-Brandt and Ole Comoll Christensen. And be sure to read our freewheeling discussion of Hergé’s work . Our celebration of Hergé’s centenary continues! 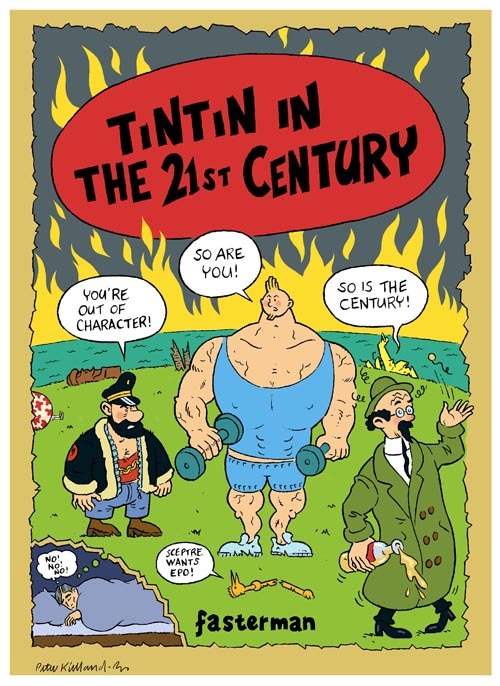 Today’s drawing, which refers to the wrong number gag that runs through several of the late Tintin books, is by Ole Comoll Christensen, one of the most versatile comics artists on the Danish scene. Also, check out the artwork in the previous instalments, by Mårdøn Smet, Miwer, Johan Krarup and Peter Kielland-Brandt. And be sure to read our freewheeling discussion of Hergé’s work . Our celebration of Hergé’s centenary continues! Today’s drawing, inspired by the back covers of the old Danish editions of the Tintin books, is by Peter Kielland-Brandt, one of the veterans of the innovative 70s generation of Danish cartoonists and one of our most original voices. His website can be seen here, his Lambiek entry here, and an archive of assorted old work here. An American edition of his masterful pantomime Fish is available and can be purchased here or here, while the original Danish edition is available from Fahrenheit. In 2006, he finished his epic, 10-years-in-the-making Jernpotte, which unfortunately has not been translated but which anyone who can read Danish should take a look at. Also, check out the artwork in the previous instalments, by Mårdøn Smet, Miwer, and Johan Krarup. And be sure to read our freewheeling discussion of Hergé’s work . Continuing our celebration of Hergé’s centenary, today’s drawing is by Johan Krarup, one of the premier representatives of the new Danish underground. Read his weekly strip “Mixed Double” here, His publishing outfit Son of A Horse can be found here, and he sometimes writes a column about alternative comics here. Johan is also a philosophy graduate and blogs about it here. 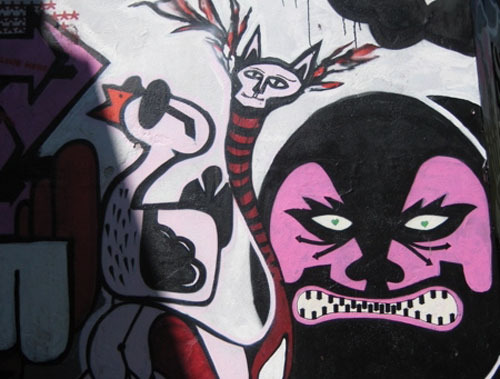 Also, check out the artwork in the previous instalments, by Mårdøn Smet and Miwer. And be sure to check our freewheeling discussion of Hergé’s work here.